New York society tended to overlook Richard T. Wilson’s Confederate past, no doubt because of his millions. Wilson had been Commissary General of the Confederate Army under Jefferson Davis, but at the end of the war he purchased now-defunct railroads, gathered his family and left the burned-out South for New York City. Wilson established the banking firm of R. T. Wilson & Co. and moved into the former residence of Boss Tweed at No. 511 Fifth Avenue. If the Yankee millionaires held any political grudges, they were soon buried as Wilson’s children married into the wealthiest and most socially powerful families. 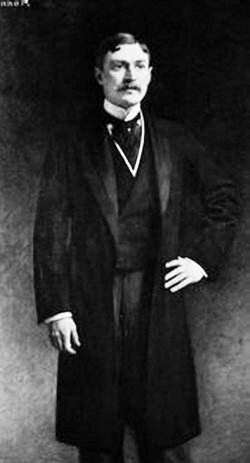 Daughter Mary would marry the immensely rich Ogden Goelet; Belle would wed the Honorable Sir Michael Henry Herbert, brother of the Earl of Pembroke; Grace would become Mrs. Cornelius Vanderbilt III and son Richard, Jr. would marry Marion Steadman Mason. But of the siblings’ high profile weddings, none would outshine that of son Marshall Orme Wilson. The engagement hit the newspapers on June 29, 1884. In florid Victorian prose The Sun reported on the match. Caroline Schermerhorn Astor , known to her friends as Carrie, had grown up in the most socially-important house in New York. 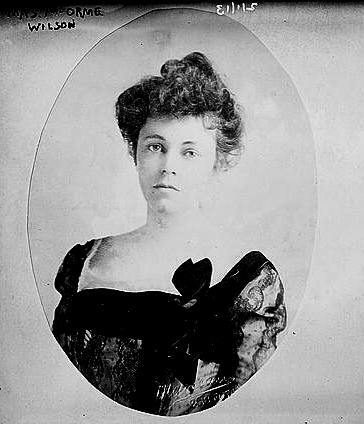 The daughter of William Backhouse Astor, she was more importantly the daughter of the imperious queen of New York society, the Mrs. Astor, the original Caroline Schermerhorn Astor. It was from the mansion at No. 350 Fifth Avenue that Mrs. Astor reigned supreme over society—arbitrarily dictating protocol and announcing who was eligible for inclusion into polite society. The wedding was held in the Astor mansion on the afternoon of November 18, 1884. The New York Times called it “the principal social event of the season” and insisted that “the ceremony was witnessed by nearly a thousand guests” in the art gallery. The Times article spent considerable column space describing room after room of floral decorations. Even the chandeliers were hung in “masses of large pink roses, rose foliage, and Japanese ferns.” There was not a prominent name missing from the assembled guests. The following day The Times reported that William Backhouse Astor issued a registered certificate for $100,000 for Caroline as an additional gift. The New York Times would comment, years later, “With the marriage of [Marshall Orme Wilson’s] sister, Grace Wilson, to Cornelius Vanderbilt, now General Vanderbilt, the Wilson family thus became connected with two of the most powerful families socially in the United States, and since that time their own prominence in the social life of New York and Newport has continued." The Wilsons moved into their new home at No. 414 Fifth Avenue and entertained in the style expected from the alliance of two of the city’s most prominent families. But there was trouble two blocks to the south. Carrie’s cousin, William Astor, and her mother were engaged in a tumultuous family feud. In 1893 William dealt a deciding blow in the battle by razing his family home next door to Mrs. Astor’s and erecting the hulking Waldorf Hotel. Carrie’s brother, John “Jack” Astor, reacted by constructing a massive double French mansion at the corner of 5th Avenue and 65th Street for his mother and himself. The Wilsons would not be far behind. As the enormous house was rising, the New-York Tribune reported on May 24, 1896 that Marshall Orme Wilson had purchased a large plot of ground just around the corner on East 64th Street. “He will build a fine dwelling there for his own use, covering the entire plot,” the newspaper said. The site for the Wilsons’ new home stretched 65-feet wide, covering the plots of Nos. 3 through 5. Architects Warren & Wetmore were commissioned to design the mansion that would leave no question regarding the financial and social status of its owners. Construction began in 1900 and would not be completed for a full three years. As the house neared completion, in 1902, Wilson sold the mansion given to the pair as a wedding present twenty years earlier. The drastic changes in that area of 5th Avenue were apparent when the house was taken over by “Lichtenstein, the milliner” for business purposes. The new Wilson house was five stories tall, clad in limestone, and fulfilled society’s every expectation. A grandiose centered entrance supported a balcony at the second floor where restrained French-style windows provided understated elegance. The two-story slate and copper mansard, however, tossed understatement aside, bursting forth with majestic dormers and oculi (bulls-eye windows). In keeping with the Beaux Arts style of the exterior, much of the materials for the forty rooms was imported from France, including marble, tapestries and wood flooring. H. Nelson of Paris outfitted the library, the “yellow room” and other spaces with wood paneling. The deed was put in Caroline’s name, and by 1904 the house was ready to receive guests. Three hundred guests filed into the mansion for the housewarming. They were entertained by opera singers Madame Lillian Nordica and Enrico Caruso. It would be the first recital of decades of musical functions held by Carrie Astor Wilson in the house, most sponsored for charitable functions. In the fall of 1906 Carrie’s mother showed signs of a nervous breakdown. The following season Jack Astor announced that the aging dowager would not be opening her Newport cottage, Beechwood. It was then that society recognized the severity of the situation. Her condition continued to decline and she was rarely seen in public. On the afternoon of October 30, 1908 Carrie Wilson rushed from her house to the nearby Astor mansion where Mrs. Astor had slipped into unconsciousness. At 7:30 that evening, with Carrie as the only family member at her side, Caroline Schermerhorn Astor died ending an epoch in New York social history. Unlike her mother, Carrie's lavish entertainments were often for charitable purposes. In January 1913 she hosted two innovative functions for the support of a district nurse in the babies' ward of the Post Graduate Hospital. She recruited wealthy socialites and their children to pose in “tableaux vivants.” The Sun reported that “The subjects will be reproductions of paintings by famous masters.” Presented in two sessions—one on the afternoon of January 27 and the second the following night—the children posed in the afternoon tableaux and the adults at night. With the country’s entrance into World War I, Carrie turned her focus to war causes. On the afternoon of Saturday February 2, 1916, the Wilsons hosted “a most successful entertainment…for the benefit of the students of the Ecole des Beaux Arts of Paris who are at the front and also for the benefit of their families,” reported The Sun. The affair was arranged by the New York architects who had been educated in Paris. The newspaper reported that “the demand for tickets was so great that the sale had to be stopped.” Among the prominent names in the audience were Mrs. Hamilton Fish, Mrs. Ogden Mills, Edward De Peyster Livingston, Mrs. Howad Brokaw, Mrs. Moses Taylor Pyne, Mrs. Auguste Heckscher and Baroness Raoul de Graffenreid. Just over a week later architect Ralph Adams Cram gave a lecture in the house, talking about the cathedral. The construction project became one of Carrie Wilson’s favored causes and she would host the sewing class of the Fresh Air Association of the Cathedral of St. John the Divine for years. On April 1, 1926, Marshall Orme Wilson died in the house on East 64th Street. Carrie lived on in the house, alone with her staff, and eventually resumed her regimen of charity teas and entertainments. Unlike her mother who had been vocal about mixing with those beneath one’s social station and who criticized her sister-in-law, Augusta Astor, for her charity works, Carrie’s philanthropy was wide-flung. Among her later interests was the New York Women’s League for Animals which met regularly in the Wilson mansion. The mansion, once the scene of glittering musical entertainments for New York’s wealthiest citizens, became home to the offices of the Consulate General of India along with residential suites for the Ambassador to the United States and members of its United Nations delegation. 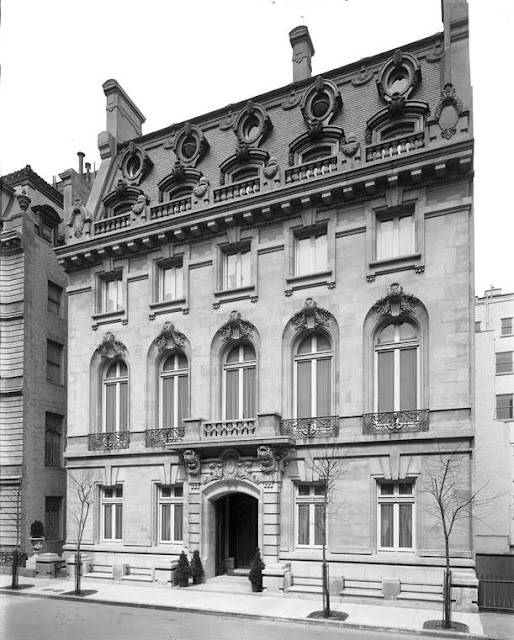 So as not to be confused with India House in Lower Manhattan, the Wilson mansion was renamed New India House. In 1952 the interiors were altered by architect Wiliam Lescaze. The stately exterior, however, remains unchanged; an imposing reminder of the days when the names Astor, Vanderbilt, and Wilson dominated New York society. Wonderful post; enjoyed it very much, thanks! A little known fact regarding this house has to do with Carrie's brother, John Jacob Astor 1V, the most famous victim of the Titanic disaster. In my research of all the Newport people who were on the Titanic, I discovered that "Jack" Astor spent his last night in America at this house. Jack and his wife, Madeleine, were dinner guests of Carrie and Orme that evening (January 25 or 26, 1912). The 400 had largely shunned Madeleine since the 1911 marriage (she was the age of Jack's son and her family was considered nouveaux). Carrie, however, was working behind the scenes to held Madeleine gain acceptance into the Old Guard. Orme helped by enlisting his sister, Grace Vanderbilt (who was on her way to succeeding Jack's mother as Queen of Society), into the cause. Carrie's dinner party was one of several pre-ball dinners given a few hours before a regal ball to which Jack and Madeleine had NOT been invided. By having the snubbed Astors at the pre-ball dinner, Carrie was commiting a bold act of defiance against Old New York. Her audacity paid off. Society did not boycott Carrie's soiree, and the presence of Grace Vanderbilt all but ensured that Madeleine was on her way to being accepted as Mrs. Astor. The next day the Astors set sail on board the Olympic for a ten week trip abroad that ended on the Titanic. Great anecdote. Thanks a lot for that interesting information. The renovations to this amazing structure I can only pray did not detract from the unique beauty it possessed. John and I will remember it always. Fascinating details about this beautiful and architecturally significant home and famous occupants. My Great Grandfather was first cousin to the Wilson clan.